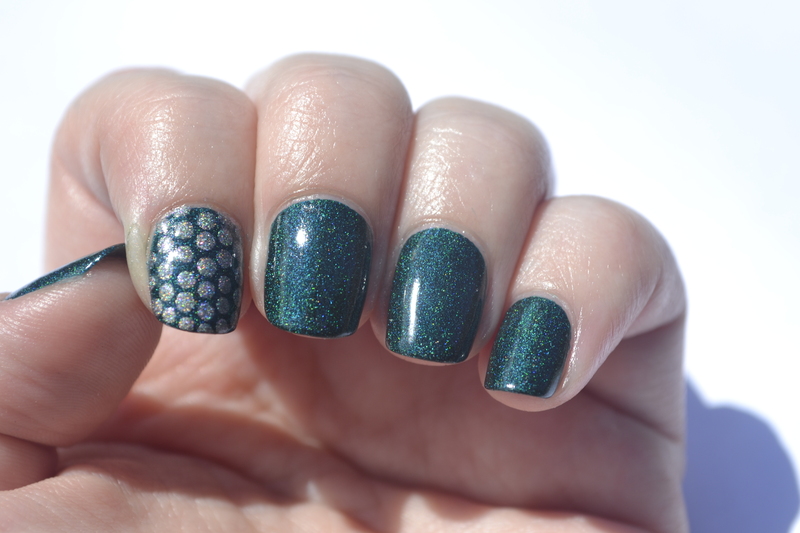 June 24, 2014 June 26, 2014 / Rachel C.
Yeah, yeah, absolutely no connection between a holodeck and this week’s mani except the word ‘holo’. 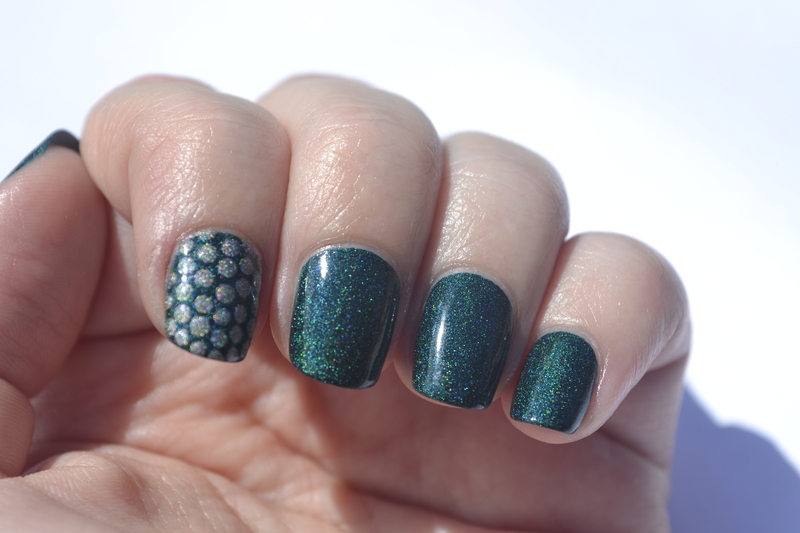 We’re meant to do a simple look with evenly spaced dots (as per The Crumpet’s post and tutorial), and I don’t think I’ve ever done one of these before. As much as I love dots, I do struggle with them when I have to be orderly. 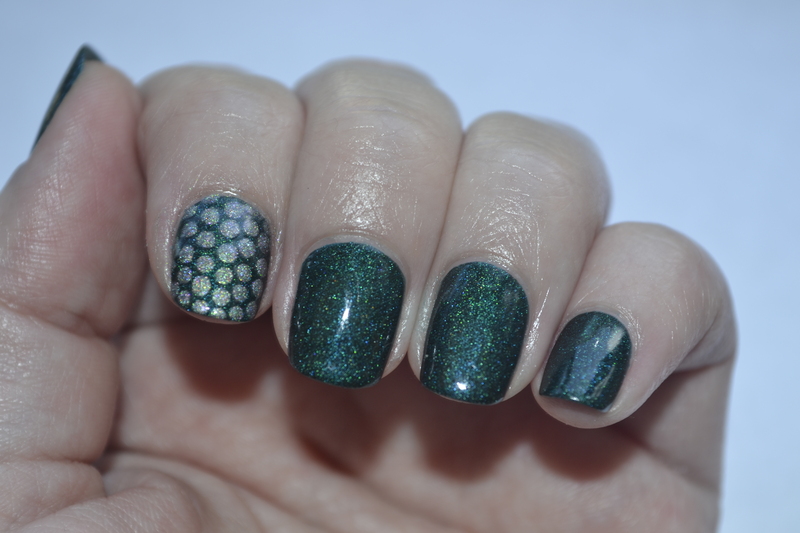 Which is a shame, because orderly dotticures can be so very pretty! But despite my trepidation with the stricter guidelines this week, I was excited to give it a try. 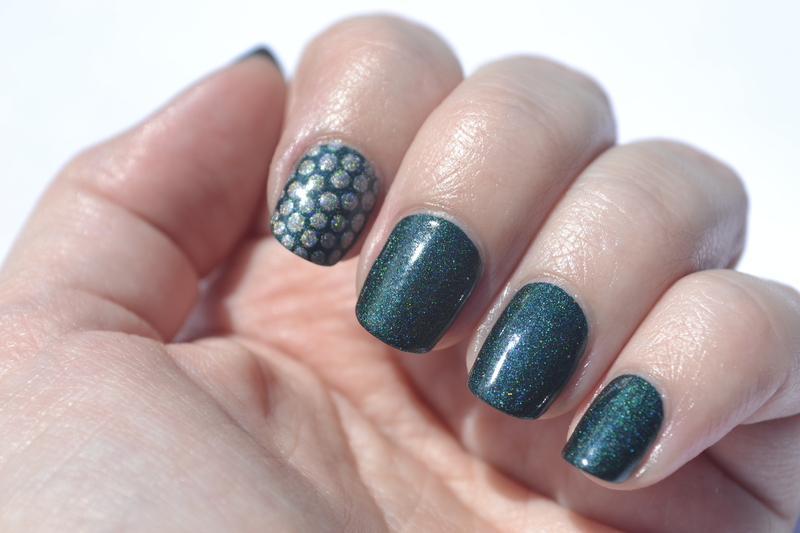 My mind immediately jumped to a-England’s Saint George for my base color because I wanted a holo and it was my first. And besides, I’ve only worn it once and that should be a crime. I tried a few different colored dots out on a test nail, but my desire for a holo-on-holo mani left me choosing between Dollish Polish Totes Magotes! and Girly Bits D!ck in a Box. One round of ‘eenie meenie miney moe’ later, and D!ck in a Box came out on top. Which was definitely not a bad thing, because look at the sparkles! 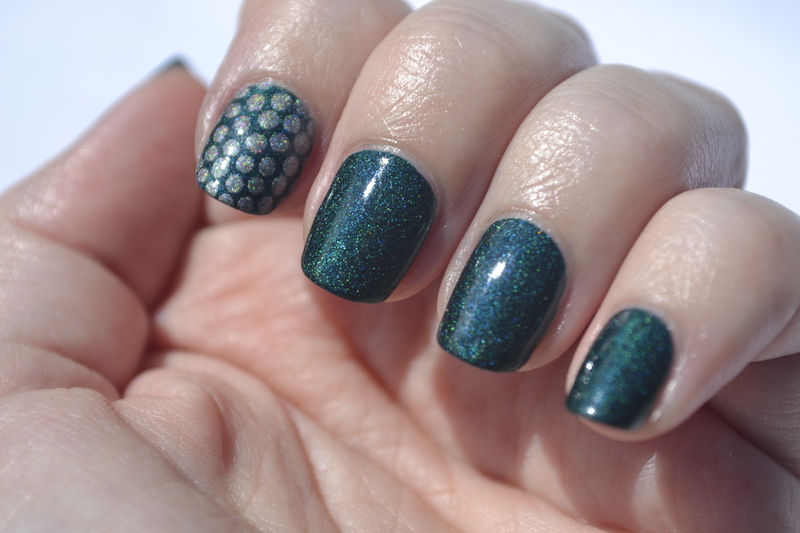 I have to say though, as much sparkle as you can see in the photos, it doesn’t quite capture the beauty of these two polishes. I thought it couldn’t get any better than direct sunlight, but when I went to feed my horse earlier this afternoon, just a little bit of sunlight filtered through the trees and caught on D!ck in a Box especially, and oh my goodness I wish I had had a camera because THAT, my friends, was the perfect lighting for this mani. All of my annoyance with trying to get evenly spaced, evenly sized dots was completely worth it in the end. This is possibly not the best place to say this, but I didn’t want to do a whole separate post. I’ve decided that I’m going to try my hand at the 31 Day Challenge (list of the themes below), so when July rolls around I’ll ideally be making daily posts. I’ve got everything planned out, with a few backup ideas for most days, so here’s hoping everything goes well!